This enchanting marble and glass mosaic, with its blend of White Thassos, wooden beige, athens gray and mirrored glass, will leave any room with a contemporary and modern feel. The mesh backing not only simplifies installation, it also allows the tiles to be easily separated which adds to their design flexibility. Enhance the aura of your home with this mesmerizing selection from our Fable Collection. Not recommended to be used as flooring. Due to the nature of stone, variations in color and veining may occur. This is the natural beauty of the product. 0.93 square foot per sheet, each sheet sold individually. Sheet weight equals 3.53 lbs. Buy online Splashback Tile Fable Prince Charming 11-1/4 in. x 12 in. 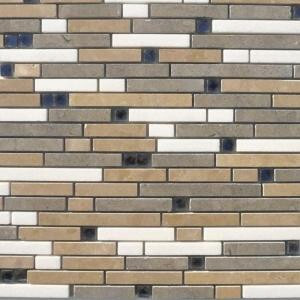 x 10 mm Polished Marble Mosaic Tile FBLPRNC, leave review and share Your friends.